Plumbers need to have graduated high school or at least earned a GED to get the specialized training needed to become a professional plumber. Plumbers have a strong basic knowledge in Math as well as in Science and Computers. Foundation in drafting and blueprint analyzing can be extremely helpful. With the increasing growth of the plumbing industry, your high school ACT score may bring consideration in getting a serious plumbing apprenticeship ahead. Some plumbing apprenticeship needs a certain number of class hours, you may be able to apply accredited coursework toward those training hours. A good combination of a classroom coursework and an on-the-job training apprenticeship program gives the most intensive training on how to become a professional plumber. An apprenticeship usually lasts to either 4 or 5 years. There is also a specified number of hours that you need to complete as an apprentice in order to obtain a license in plumbing. This specified number of hours may vary in number by state. The most usual method of getting an apprenticeship is through a plumber’s union. Some unions give the required class coursework as well as matching you for a field training with a licensed plumber. There may also be a required aptitude test when applying for a plumbing apprenticeship. Requirements such as a valid driver’s license, proof of legal employment status or ID. If you cannot secure an apprenticeship through the local plumbing union, you may ask a licensed master plumber in your area who is already operating in their own business, if they will be interested in having you as an apprentice. Keep in mind that in order to fulfill the required hours, you will need to find your own accredited plumbing courses if your apprenticeship does not offer the classroom coursework portion of the training. A plumbing apprenticeship typically lasts for 4- 5 years. As apprenticeship programs combine gaining classroom knowledge, and a hands-on application with licensed plumbers, apprentices usually get wages, too, so you are getting paid while you are in training. 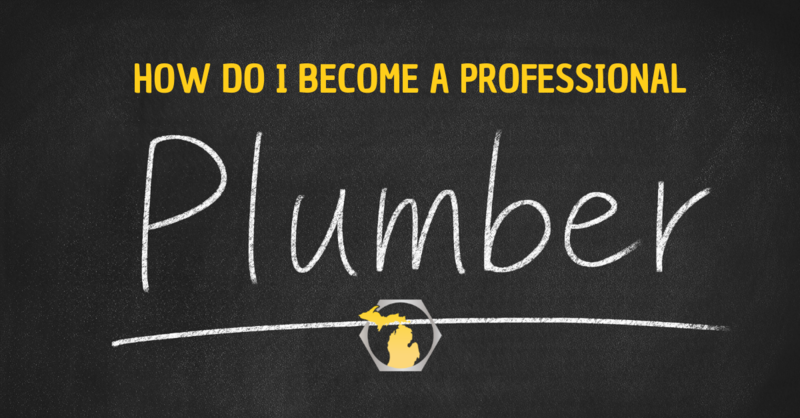 All plumbers working in the plumbing industry in Michigan must be licensed as either a Journeyman or a Master plumber by the state. Apprentice plumbers are required to be registered with the state, but are not licensed. The Michigan Department of Licensing & Regulatory Affairs - Plumbing Division is responsible for the administration and enforcement of the Michigan Plumbing Code and the plumbing provisions of the Michigan Residential Code by conducting inspections of plumbing equipment and installations. The division also follows up on violations of the Michigan Plumbing Code and assures proper plumbing permits have been issued. The next and the final step on your career path as a professional plumber is to become a master plumber by accomplishing and getting a continuous training, education and field experience. You may also obtain an additional certification by earning and completing training in areas like inspection testing and energy efficiency training. While this is not required, these certifications can be beneficial as it gives you a competitive edge in the plumbing market. When it comes to having the technical side of things, skills are a must. While the typical duties of a plumber involve analyzing building plans and water supply layouts such as water heater repair, installing pipes, identifying leaks and estimating the time it will take including the cost of the job. The vital skills that a professional plumber must have are good problem-solving and analytical skills, being able to work in a team, strong interpersonal skills, and physical stamina. These attributes can be developed through training and experiences, the passion and potential must already be there when you start out. Thank you to Luisa Nacpil for this guest article! Luisa is a Freelance Medical and Content Copywriter, she's also an SEO Specialist at barkitloud Agency. Die-hard lover of chocolates, novels, and adventures, and when she has free time she rides the waves of the ocean and loves to dive into the deep blue sea. "